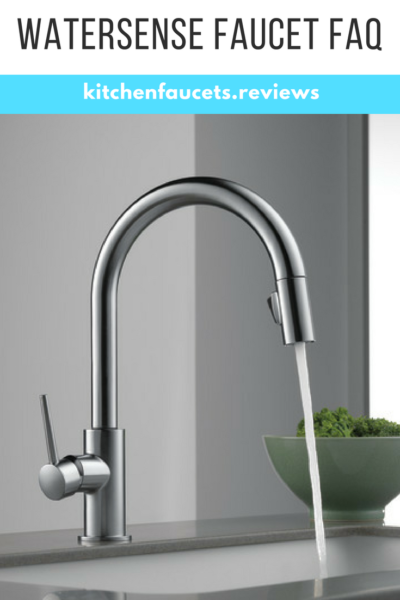 Watersense Faucet FAQ: what it means, and why buy certified fixtures! What kinds of products are certified by the Watersense program? Why should I buy a Watersense-certified product? When you’re shopping for kitchen faucets, or for any other plumbing fixture, you’re likely to see lots of models labelled with a Watersense logo. It’s sized and shaped much like an Energy Star logo that you’d see on an appliance or a lightbulb. We’re often asked about Watersense, and we know that many consumers aren’t clear on what exactly it means or what it certifies. We’ve put together this helpful primer to fill you in on all the key info surrounding Watersense. You’ll learn what the program is, how it operates, and what it means for you, the consumer! Watersense is a government program sponsored by the EPA (Environmental Protection Agency). The program serves to certify water-efficient products, and to educate consumers about water conservation. It’s roughly equivalent to the Energy Star program, only Watersense focuses on water usage instead of electricity consumption. Through its voluntary certification program, Watersense encourages companies to produce products such as faucets or toilets which use at least 20% less water than required by law (the EPA sets mandatory restrictions for all products sold in the US). Manufacturers who participate in the Watersense program offer products which meet the stricter standards to the certification authority. These are then submitted for impartial lab testing by the EPA. Products which pass EPA inspection and testing are then certified and labeled with the Watersense logo, which you’ll see on the box/product images online! As we mentioned above, Watersense guidelines encourage manufacturers to create products which use less water than is legally required. To meet the certification criteria, products must use at least 20% less water than standard models. Many manufacturers use misleading terminology to make you think their products are efficient, but very few actually meet their own claims. Watersense-certified products are tested in EPA labs to make sure that they won’t use any more water than they ought to. Watersense lab testing also looks at how functional a product is. One of the biggest issues with water-saving products historically has been that they didn’t work particularly well. To make sure that consumers aren’t put off by that legacy, the Watersense board has created functionality guidelines to test all certified products. When you see a Watersense logo, you can rest easy knowing that product both saves water and works at least as well as the wasteful competition. One notable exception is washing machines, which use water but aren’t certified by Watersense. They actually fall under the Energy Star guidelines, even though the Energy Star standards dictate that certified washing machines must only use 15 gallons per load as opposed to the standard 23. You’ll do your part to conserve water. In the past, it was easy for Americans to think of water shortages as things that only affected people overseas, especially in Africa. That’s no longer the case. Water shortages have hit hard in the States, and are only projected to worsen. California and other Western states have seen severe droughts already. According to the EPA, officials of 40 states are projecting some level of water shortages in the next few years. Water is not an unlimited resource, which is why it’s so important to change our mentality around using it. Most of us go about our lives in a way that assumes water will never run out or be unavailable. On the contrary, only 1% of the water on the planet is actually fit for consumption. So it’s no surprise that the EPA and many environmental groups want us to cut our usage far below the 88 gallons per day currently used by the average American. Even if you don’t think you waste a lot of water, you still might. Bathrooms account for over half of all indoor water usage, and unless you’ve recently upgraded to an efficient fixture, you could be wasting gallons upon gallons. For instance, many older shower heads used 5+ gallons per minute. Anything sold today is required to use half that, while Watersense models are even more efficient. The same is true of toilets, faucets, etc. Even faucets with newer Watersense aerators are 30% more efficient. So, there’s a lot to be saved by making simple upgrades to your plumbing. Just replacing your shower heads with Watersense models can save you 4 gallons of water every time you shower–more if you’re coming from an older fixture. That’s water saved, and less energy used to heat it! One other thing worth remembering: these savings can all be had without sacrificing functionality. You’ll still get a good shower, and the average Watersense toilet today flushes far more effectively than older models that use 4x as much water. Despite the fact that Watersense-certified products conserve far more than is required by federal law, some states have their own restrictions in place. For instance, California implemented fairly strict guidelines for water usage after the last drought. In some categories, Watersense-certified products are all you’ll find in CA. The same is true of other states, particularly in the West. You’ll end up saving in the long run. There are often financial incentives available to consumers who buy energy and water-efficient products. You’ll find them offered by local water utilities and municipal governments, as well as on the state and federal level. Do some research while you shop, and you’re likely to find at least one kickback to lessen the cost of your upgrades! You’ll save on your utility bills, too. Most of us don’t have wells, so we pay for water from the local utility. That gets very expensive, and it’s money you don’t need to be spending. Especially on things like toilets, you can save vast amounts of water when you upgrade and still end up with a more functional fixture! When you start to look at things like faucets and shower heads, you should also consider that you’ll be saving energy at the same time you’ll save water. Every gallon saved is a gallon you didn’t have to heat! That’s why upgrading your plumbing makes for savings across the board. You’ll be assured a functional product. As we’ve already mentioned, there are countless low-flow and water-saving fixtures that simply don’t work well. Watersense-certified products are tested to perform as well as anything else on the market. Think of this certification as a quality assurance as well as an indicator of efficiency! Now that you’re an informed shopper, check out our buying guides and recommendations! You’ll find links to all of them on our homepage.